Each year, staff and community of Providence St. Joseph Health commit to mission work – a unified effort to deepen the connection with our mission to help our most vulnerable populations. This year, the PSJH clinical leadership chose to support teen suicide awareness and prevention. Knowing that adolescent suicide is often motivated by feelings of depression and isolation, they were inspired to focus on the table as a center of healing and community. The clinical leaders pooled their most treasured recipes to create a collection of dishes that can be prepared and enjoyed with friends, communities and loved ones. Included also are stories and recipes from both the Sisters of Providence and the Sisters of St. Joseph of Orange. 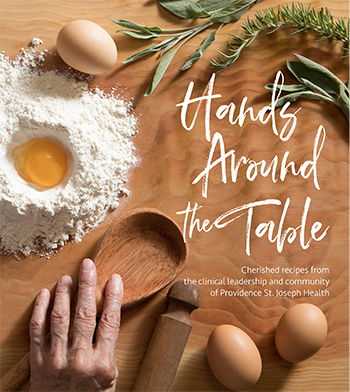 Providence St. Joseph Health is proud to offer the Hands Around the Table cookbook, just in time for holiday season shopping, while supporting a very important cause in our communities. There is probably no single more curative act than preparing and serving a meal. It’s how we offer nourishment and sustenance. It’s a means of gathering family or friends – or sometimes even strangers – together. It’s a demonstration of love. We know that breaking bread has always been a sacred gesture. Scripture frequently refers to the meal as a way to encounter God and to heal. On countless occasions, Jesus offered food to outcasts as an act of inclusion. It was during a communal meal that he gave spiritual life to his followers and at another that he showed how he had risen. Such is the inspiration for the cookbook. The recipes include old family favorites, fiercely guarded secrets, and creatively amended standards. They’ve been served at annual holidays, special occasions, and simple weekday dinners. They’re offered in memory of lost loved ones or in honor of the living. And, in many cases, this is the first time they’ve been shared outside of cherished family recipe files. Among the recipes you’ll also find historical anecdotes from the Providence Archives, as well as personal profiles of key leaders across Providence St. Joseph Health. It is hoped that the cookbook will soon be lying open on your kitchen counter, covered with the drips and splatters of your own meal preparation, as a gathering of loved ones waits to share in the blessing. Hands Around the Table is now available for purchase for $25. The money raised from this project will augment the funds that Providence St. Joseph Health has earmarked for teen suicide prevention programs. To purchase cookbooks, or for more information, please contact Hilary Kesner at Hilary.Kesner@providence.org.